She has been married to Henrik Forsberg since 1996, also a biathlete and cross country skier. Competing from 1993 to 2002, Forsberg won six straight overall wins in the Biathlon World Cup from 1997 to 2002. She also won six gold medals in the World Championships , became runner-up once, and placed third four times. At the 2002 Winter Olympic Games, Forsberg won two bronze medails. In her career she managed a total of 42 individual Biathlon World Cup wins, which is more than any other female biathlete to date. Forsberg competed as a cross country skier from 1988 to 1996. Her best finishes at the Winter Olympics was at Albertville in 1992 where she finished seventh in the 4 x 5 km relay and 26th in the 15 km event. Forsberg's best finish at the FIS Nordic World Ski Championships was tenth in the 30 km event at Lahti in 1989. 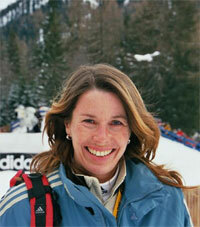 Her best World cup finish was second in a 10 km event in Finland in 1988. Forsberg competed at the 1998 Winter Olympics both as a biathlete and as a cross country skier. She is the only Swedish athlete to have won Jerringpriset four times. Magdalena Forsberg has retired from active sports after the 2001/2002 season.